Want to get ahead? You have to know how to look the part. So much has changed so quickly that many people just don’t know what they should wear to work. Some believe they are dressed appropriately when their choice in clothes is really sabotaging their careers. Beyond Business Casual gets rid of the guesswork and the uncertainty. The book is filled with answers to the most commonly-asked questions about how to make the right choices no matter what the business situation. 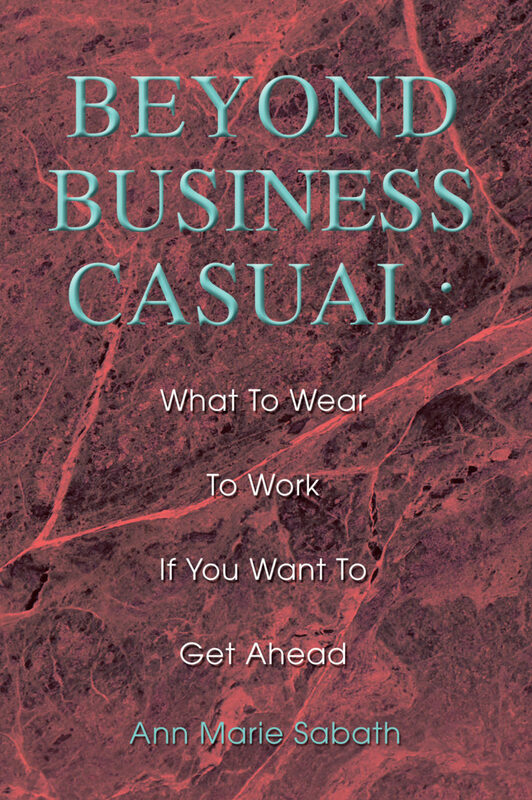 Beyond Business Casual is laid out in a series of questions and answers. You can read the book in sequence, or skim through the table of contents to find the information you need. The book is filled with real-life examples from the author’s workshop participants and others she has coached to look the professional part. "Everybody whose appearance matters could benefit from reading this book." —James R. Canova, President, Tech Electronics, Inc.
"This book answers all the questions college students are afraid to ask and even some they didn't know they had." —Angelle Bujol, Executive Director, Pi Sigma Epsilon, Inc. Question: I’ve been in situations where I showed up for work only to learn that a last-minute meeting had been scheduled that required business professional attire. How can I prevent this from happening in the future? Answer: Easy. From now on, be better prepared. Have a change of clothes available either in your workspace or car trunk. This way, when you are asked to fill in for someone and realize that a more formal outfit is in order, you can make the switch. By having another set of clothes accessible, you will never have to apologize for how you look. Invest in the best quality clothing you can afford. Remember, less is really more. Recognize that dark colors can take you just about everywhere and tend to be more versatile than lighter-colored clothing. Recognize that the way you maintain your nails can add or detract from your overall look. Never underestimate the power of well-maintained shoes. Shoes definitely can make or break an outfit. Always follow the “Rule of 13.” In other words, wear enough accessories to command presence, yet no more than 13. Otherwise, your accessories may become distractions rather than accessories. Question: What is the secret to looking promotable? Answer: Easy, look around. Take note of what recently promoted individuals within your organization are wearing. Are they dressed like the CEO of your organization? If so, follow suit. Question: When first beginning at a new organization, who should I ask about what is considered appropriate? Answer: Try asking the human resource director or the person who offered you the job. These individuals will be able to guide you in the right direction regarding their organization’s dress expectations. Question: I am preparing to go to a second interview for a job that I’d really like to be offered. Because I will not be graduating from college for a few months, I only own one decent pair of interview slacks along with a blazer, which I’ve already worn to the first interview. Will I sabotage my chances for being offered the position by wearing the same outfit to the second interview? Answer: Not at all. Wear the same slacks and blazer, changing the shirt or tie (if you are a man) or the scarf and earrings (if you are a woman). Most interviewers will not be distracted if you show up in the same outfit. However, if your clothes are not well maintained they will probably notice.